Indian Chief of Naval Staff Admiral R.K. Dhowan will be paying a five-day visit to Singapore and Thailand this week in a bid to strengthen naval cooperation and boost India’s ‘Act East Policy’ in the region, according to an official government statement seen by The Diplomat. Since Narendra Modi took office last year, India has been attempting to further boost cooperation with Southeast Asian states as part of its ‘Act East Policy’, a variation on the ‘Look East Policy’ first formulated under Narasimha Rao in 1991. As I have noted before, the Modi government’s use of the ‘Act East Policy’ is designed to signal a more action-oriented policy toward Southeast Asia (See: “Modi Unveils India’s ‘Act East Policy’ to ASEAN in Myanmar”). This applies to defense relations as well, and Dhowan’s trip is being publicized as a case in point. In Singapore, Dhowan will be enhancing arguably India’s most comprehensive bilateral relationship in Southeast Asia as both countries commemorate the 50th anniversary of their diplomatic ties this year. More specifically, naval cooperation between the two countries covers nearly the entire spectrum of naval operations. During his trip there, Dhowan is scheduled meet several dignitaries, including the country’s defense minister. He will also visit the Singapore Armed Forces Training Institute as well as facilities at Changi Naval Base, where Singapore houses its International Data Fusion Center (IFC) (See: “Singapore Calls for Global Action to Tackle Maritime Challenges”). Dhowan will then move on to Thailand, where he will be from July 23 to 25. Here, he will encounter a defense relationship that both countries have been looking to boost, as I have noted previously (See: “India, Thailand Seek Expanded Defense Ties”). The goal of the visit, according to the statement, is to review and increase maritime cooperation at the highest level. Specific areas being considered for further cooperation between the navies include hydrography, developing comprehensive maritime domain awareness through the exchange of white shipping information, and increasing the scope of coordinated patrols. 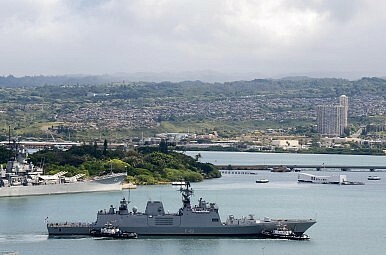 Dhowan’s visit comes just a few weeks after Indian warships made port calls in several Southeast Asian countries as part of a 45-day broader operational deployment to Southeast Asia and the Southern Indian Ocean. As I wrote then, the ships made port calls to Indonesia, Cambodia, Thailand, and Singapore, where they participated in the bilateral exercise SIMBEX-15 with the Royal Singapore Navy (See: “Why Are Indian Warships in Thailand and Cambodia?”). New Delhi hosted SIMBEX 2016.